An Apple patent application published Thursday describes a next-generation iOS Remote app system capable of translating the Apple TV's UI to smaller format iPhone and iPad screens, while streaming back external content like movie trivia from those same devices. 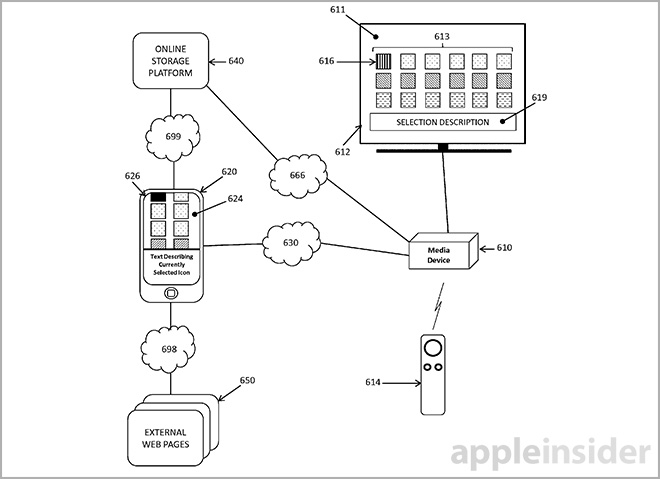 As filed with the U.S. Patent and Trademark Office, Apple's patent application for "Browsing remote content using a native user interface" details what amounts to an advanced Apple TV remote control app that interprets media content and semantic information to reproduce a graphical user interface native to an iPhone or iPad display. Unlike Apple's current Remote app, which employs a bespoke UI tailored specifically for the iPhone or iPad, the proposed iteration would dynamically "size down" an Apple TV's GUI based on semantic cues sent to the client device from a source Apple TV or Mac running iTunes. Using this method allows for a much richer user experience that moves beyond the existing digital reproduction of remote control hardware. For example, the app can display a full Apple TV interface —or icon matrix —remotely, including media descriptions, posters, ratings, purchasing options and more. Code for interpreting semantics information sent out by the host device can be kept on board a client iPhone, or the programming can be tapped from an off-site server like iCloud. Keeping semantics translation instructions in the cloud allows for greater flexibility with older devices not usually supported by a modern app. 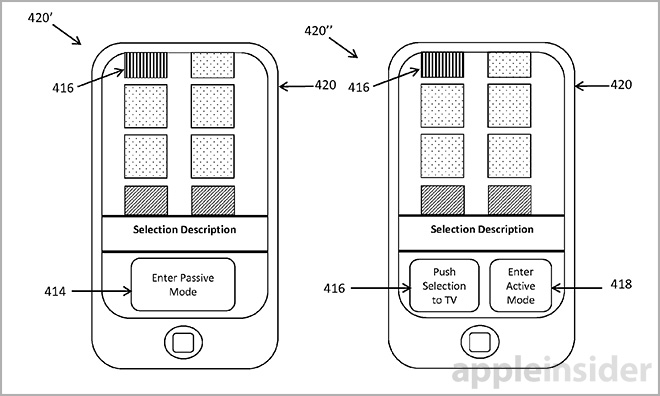 Apple outlines two possible embodiments for the remote app, one active and one passive. With the active version, users interact with an Apple TV or other host device in real time, meaning any selections made on the iOS device are immediately be reflected on the larger television screen. Most of the document deals with the above described active mode, though mention is made of passive operation in which a client device stores user input, then pushes that data to the host device when instructed to do so. Passive mode can, for instance, let one user browse through a host's media catalog without disturbing other viewers. This method is also a starting point for streaming media from an iOS device to a host Apple TV, a capability already offered with AirPlay. One of the more substantial features involves outside content gathered to augment media being played or streamed by the host Apple TV. For example, a user may start a movie via the iOS device, then leave the remote app to search for trivia on the Web. Any information discovered outside the remote control app can then be sent back to the host device for display, whether it be an overlay, sidebar or other means of presentation. In addition to the operational enhancements, Apple also notes client devices can be paired with an Apple TV via proximity sensor technology, suggesting support for iBeacon. Since Apple TV software update version 6.1 launched in March, the set-top streamer has been able to scan for compatible devices over Bluetooth. 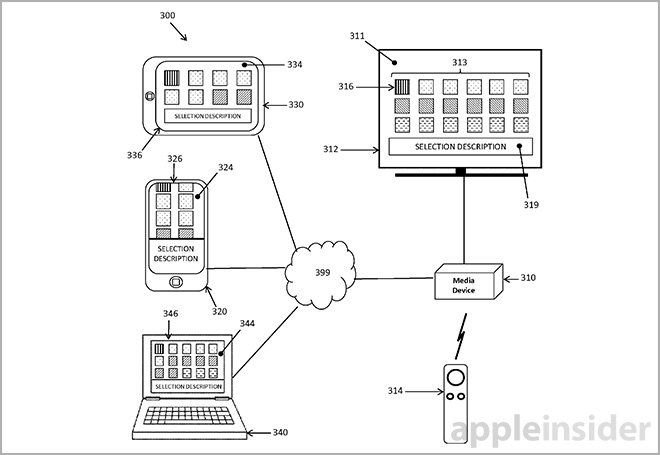 Apple's patent application for a next-generation remote app was first filed for in March 2013 and credits Thomas Alsina, Lucas C. Newman and Nicholas James Paulson as its inventors.